Universal joint is featured to provide torque transmission under mutual rejection of drive shaft’s elements by 15° angle. 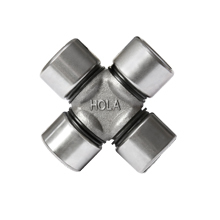 Construction of HOLA universal joints is designed to meet vehicle-manufacturers’ requirements. Body is made of alloy steel and is heat treated to provide pin’s high-surface hardness. Needle rollers and outer race of bearings are produced from special bearing steel and are heat treated as well. Bearing seals are made of petrol-and-oil resistant rubber and provide reliable sealing of units in working process. To make installation process easier and ensure complete fixation of universal joints new retaining rings are included in complete set. Technology of universal joints production provides for maximum automation of manufacturing processes. Body of universal joints, seals, bearings and retaining rings pass through 100% control of the geometric dimensions. Durability in heavy road conditions is secured due to reliable sealing of bearing achieved through using of original seals. Estimated operating life of universal joints is more than 24 months or 100 000 km run*.